Outbreak- Gaming the Z Apocalypse: OUTBREAK- Gaming the Zombie Apocalypse released at GENCON! OUTBREAK- Gaming the Zombie Apocalypse released at GENCON! For far too long, I have been remiss in talking about the ruleset which my colleague Colin and I have been working on for our zombie games. I eluded to it once in an after action report I did, but nothing other than that. It has been in the works for over a year or so, and now it is fast coming up on it's time of release, and so it is time for me to start talking about it with you guys! It comes in a soft back version and as a PDF, both in Hazmat yellow for easy spotting! I will delve a bit more into the rules in a future post. Colin and I have been writing rules together for a few years now, including the Skirmish Sangin ruleset (which has just had it's latest supplement released! ), and given our love of the Zombie genre, it was only natural that we wrote ourselves a game to play it! I will go through the rules in a bit of detail, and show examples of how the game works with some demo characters, and will walk through a combat turn or two. What would you like to see? So all of that is going to be released at GENCON in two weeks time, Colin and I will be there in bright yellow t-shirts (we had to really, given the colour of the book), so if you are going along, come and find us and pick up your copy! 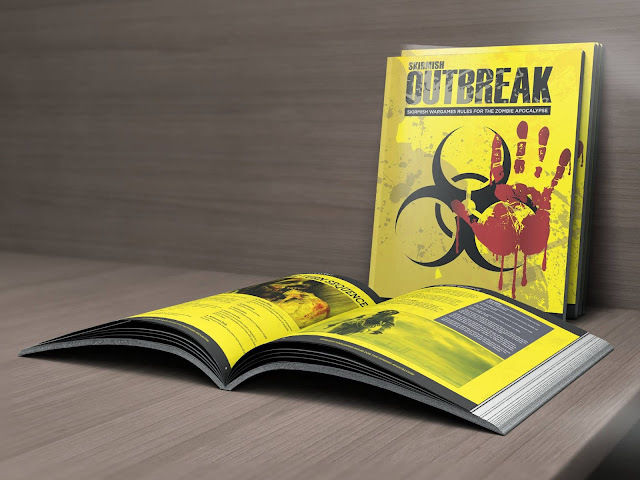 For those who can't make GENCON, or who can't manage to find us (which, given our yellow I think is unlikely), the OUTBREAK website will go live with the books and miniatuees up for sale on the website in early August, as close to the end of GENCON as we can manage.